It couldn’t be more simple. Think of the sandwich, take it apart and build it on a plate. 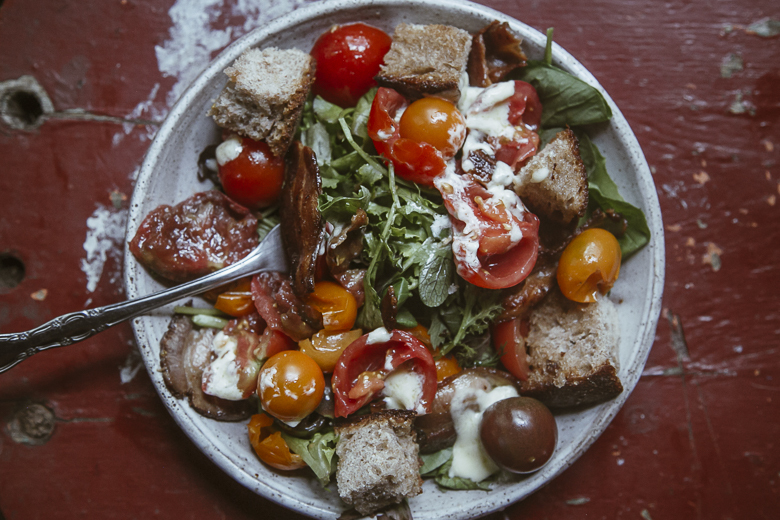 This BLT-turned salad is the perfect meal for late summer, and a great way to savor the prolific cherry tomatoes in season now. 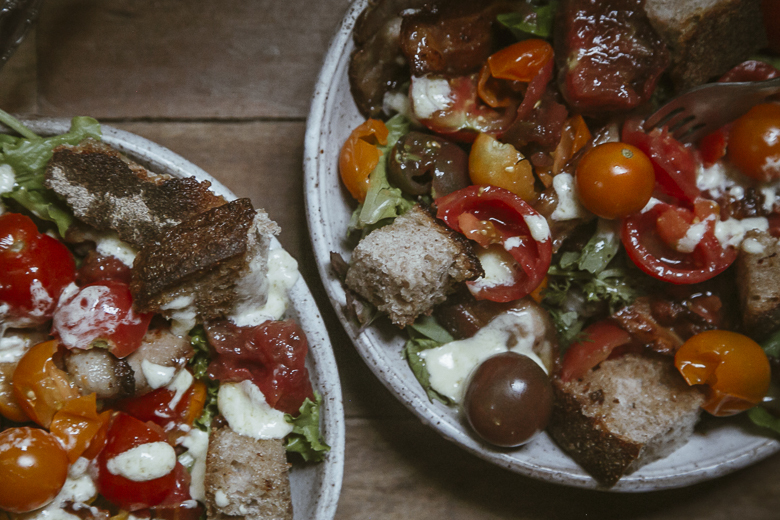 Mixed greens replace the traditional iceberg lettuce and serve as the base for salty, crunchy bacon, juicy heirloom tomatoes and candy-like sungolds, crispy croutons (toasted in leftover bacon fat! ), all united in a tangy dressing made homemade mayo. Enjoy! It goes without saying that you can (and should!) find all of these ingredients from local farms and food producers. I’ve given examples of the farms I used this time, but you can probably find all of these items at your farmers market, in your CSA box, garden, or local co-op or grocery store. For the mayo, I use this recipe. I generally double the batch since I like to keep homemade mayo on hand, but the amount made is up to you! This recipe will make enough to dress this salad. Start with the bacon. Cook over medium heat until crispy. Remove and let cool. Save the bacon drippings for toasting the bread. Slice or tear the bread into rough squares. 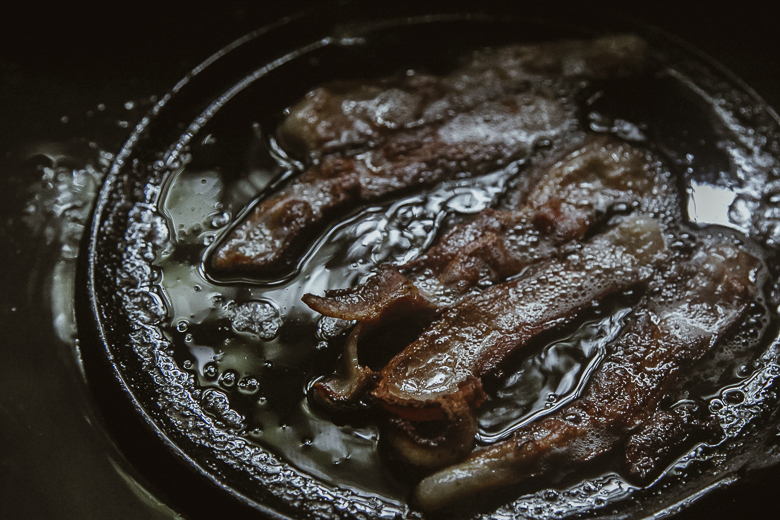 Toast them, turning as needed, in the bacon fat, until golden brown and crisp. Make the mayo per instructions via the link above. On two plates, arrange generous handfuls of greens. Smash or slice the tomatoes (cherry tomatoes in halves and larger tomatoes into quarters or smaller pieces) and add to the greens. Tear the bacon into pieces and add to the plates. Mix it all together with the toasted bread croutons and top it all with a drizzle of mayo. Dig in and savor the taste of August.